Unseasonably cold temperatures during the first week in May had siginificantly dropped water temperatures in the Little Pigeon River around fifteen degrees. I decided to stay off the river until the temperatures rebounded. On April 30 the water temperature in the Little Pigeon was 74 degrees and the smallmouth fishing had been fantastic. By May 8, the water temperature was 64 degrees and the smallmouth fishing is what I would characterize as fair. I did manage to catch 18 smallies in 5 hours of fishing. The biggest fish was 20 1/2 in. long and is pictured above. 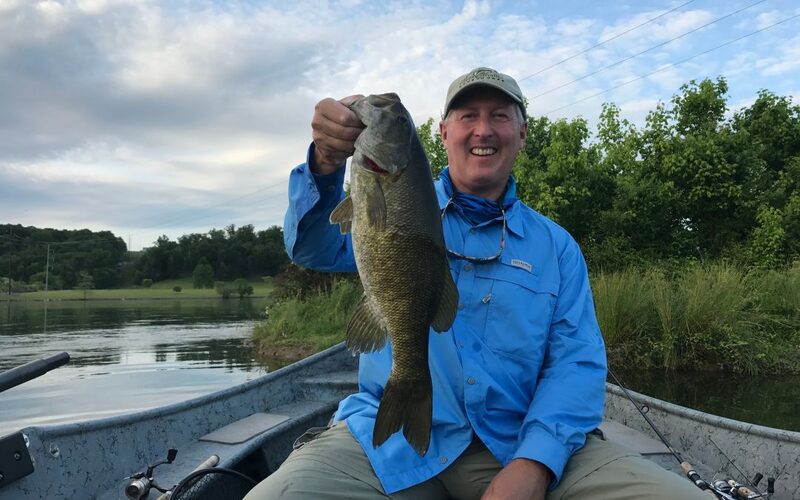 Warmer weather is forecast for the next several days and my hope is that the bite will increase as the water temperatures begin to rise. As far as I can tell there are still plenty of post spawn smallies in the Little Pigeon. Their exodus back to the French Broad may have been slowed with the sharp reduction in water tempertures. Speaking of the French Broad TVA has been running two or more generators at Douglas Dam for a couple of weeks now so most of my time has been spent on the Little Pigeon.